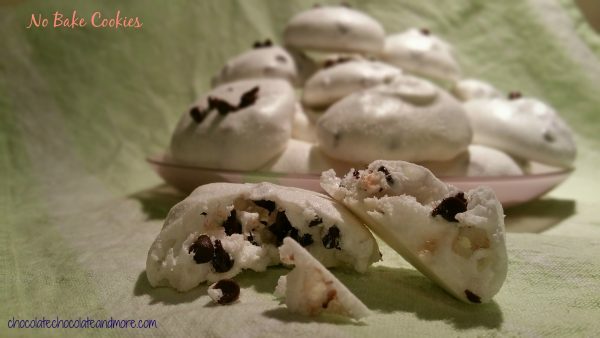 Chocolate Chip Meringues - Chocolate Chocolate and More! These are the easiest chocolate chip meringues you’ll ever make. Pop them in a hot oven, turn it off and forget about it. Jen Roberson here again — I really, really love recipes that are yummy, have three or fewer ingredients, and are a dream to clean up. My friend Stacey’s recipe for no-bake cookies meets all of these criteria, which is why they’re one of my favorite treats to make for friends (or sometimes even for work). 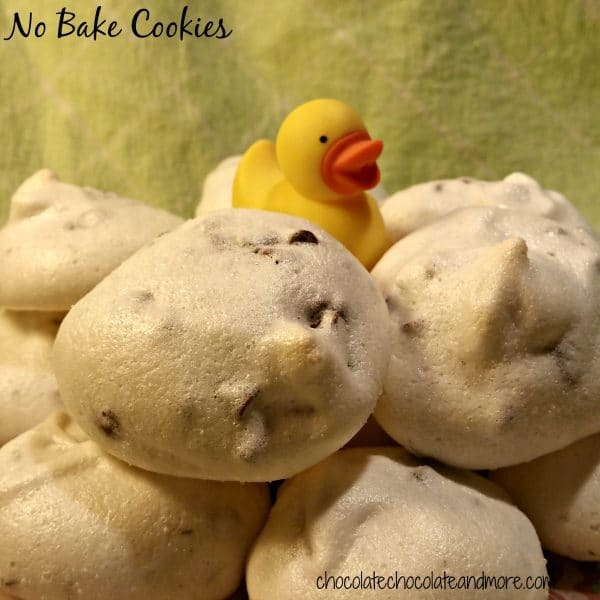 These cookies look great, and the baked meringue gives a nice crunch to a tasty sweet treat. These are seriously simple cookies to make and use the oven only minimally (hence the “almost no bake”), which makes them ideal for mid-summer sweet snacks. They’re super-fast, too: in less than five minutes you can whip up the egg whites, add the white sugar, fold in some chocolate chips (or other fixin’s–Stacey loves to add in crushed up candy canes, while I’ll sometimes toss in a quarter-cup of shredded coconut if I have it handy), and get them measured onto the baking sheet. The best part is that you then “bake” them in an oven that’s been pre-heated and turned off. You don’t have to keep checking a timer to see if they’re done yet, or over-baked; you don’t have to worry that your oven is five degrees to hot or cold. They’re the ultimate in low-maintenance cookie! A few notes on preparation, most especially about the meringue. I prefer to use a metal mixing bowl, chilled in the freezer until it’s good and cold; to whip the egg whites, I use a hand-held mixer instead of my stand mixer because I like to spin the bowl around as I move the mixer to get the best mixing coverage. Your mileage may vary, and I encourage you to use whatever works best for you! The same holds for cream of tartar: I didn’t use it because quite frankly I’d run out. I have, however, used it when my egg whites were being particularly feisty, and it makes absolutely no impact whatsoever to the taste of the cookies. These can be stored in a plastic container for roughly two days (or a little bit longer when it’s cold and dry out). Beat two egg whites (and ¼ teaspoon cream of tartar, if desired) until stiff. Add the sugar, mixing it in a little at a time, until it’s completely mixed into the egg whites. Fold in the mini chocolate chips using a rubber spatula. Put cookies in the oven and immediately shut the oven off. The cookies should be done in half an hour but can be left in overnight. 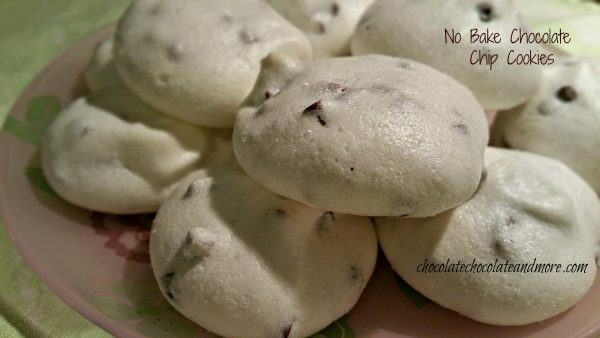 Note from Stacey: This recipe has been adapted from an ancient recipe for mint meringues. If you like, you can add crushed up candy canes in whatever amount you find pleasing when you’re folding in the chocolate chips. These sound easy and delicious. I have never made meringue cookies before always thought they would be hard. I was wondering if you can add finely chopped pecans. These look really yummy! Thank you for sharing.